A spiky bundle of scrumptiousness. It must be nearly two years ago now that I made a batch of chestnut brandy. 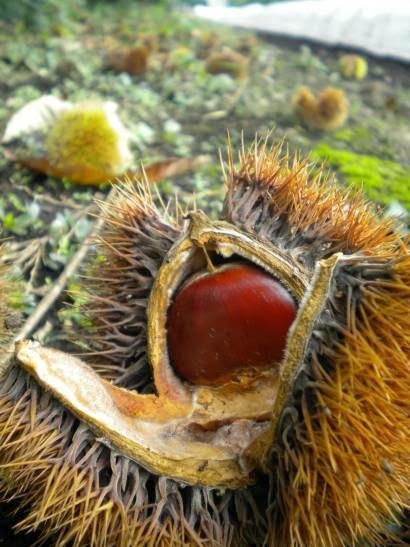 There is a lovely kuri (chestnut) grove at the farm, and the farmers always give me a nice bundle to make kurigohan (chestnut rice) or whatever else suits my fancy. Since arriving here I've been on a homemade alcohol kick. It started with umeshu and I began experimenting from there. We now have a shu closet full of homemade brews that we are trying to drink our way through before having to move early next year. (If you'd like to help with that, let me know.) It was only natural to try something with the kuri. So, the bits of chestnut have been steeping since then, and I decided it was time to turn them into something else. (Mottainai and all that, you know.) So, I found this recipe at Food in Jars for chestnut butter, tweaked it, and made my own Tokyo version. The result is rather pleasant on toast, if I do say so myself. Combine ingredients in a bowl or food processor and whip until smooth. Add water as needed, but be careful not to add too much or the mixture will turn out runny. I used a wand mixer and it did a great job, but probably took a bit more time than a food processor. Spoon into jars, remove air bubbles to the best of your ability, and refrigerate. Serve on toast, with cheese, or just on the spoon. It's all quite nice!